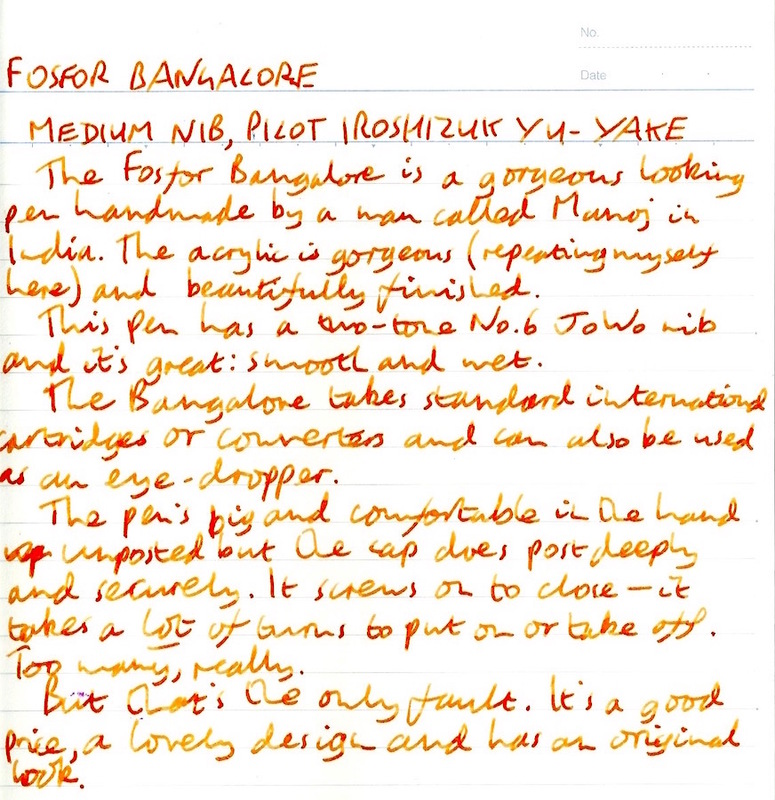 Fosfor Bangalore Fountain Pen Review – Pens! Paper! Pencils! Fosfor is the work of one man named Manoj, based in India. 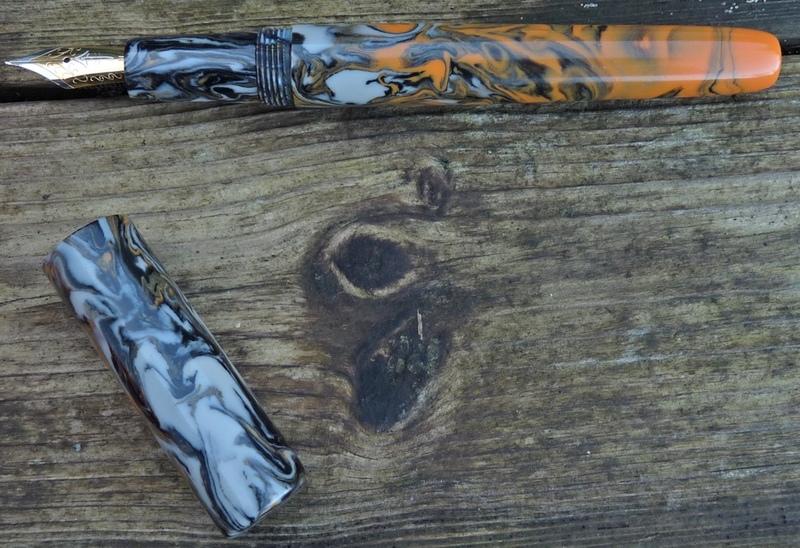 Manoj combines his own combinations of acrylic to make unique designs and then makes each pen by hand. 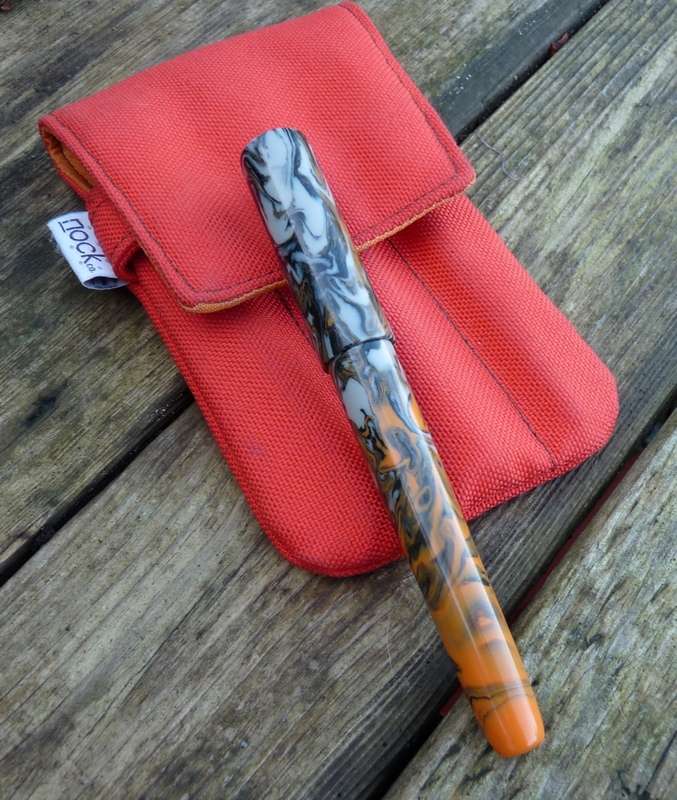 He also makes many pens from wood (and, I can assure you, I will be buying one soon). You would expect such a pen to be very expensive. You would be wrong. 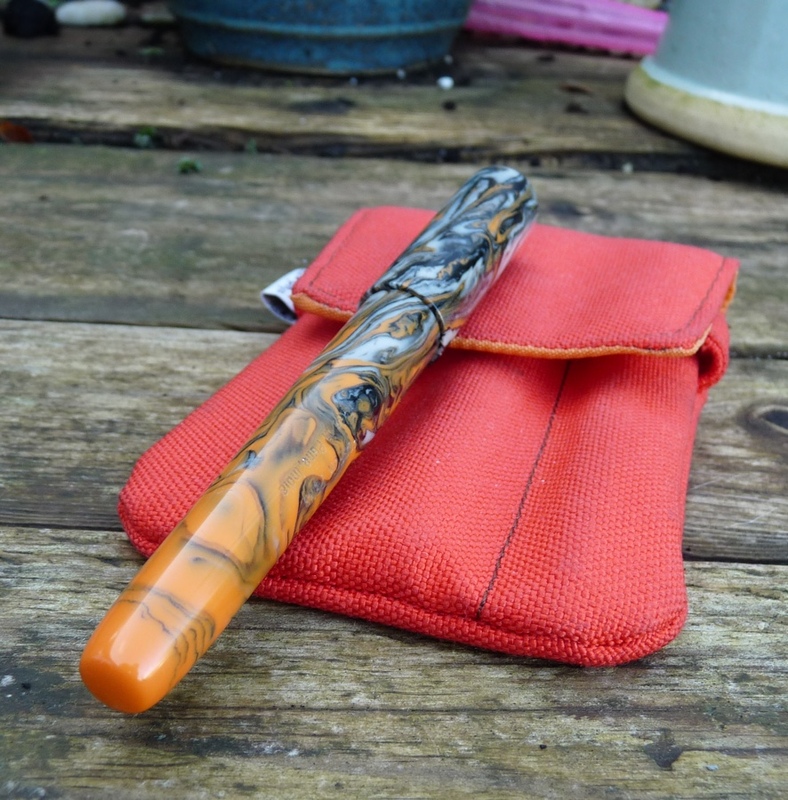 My pen, lent to me by Scribble Monboddo, has a medium steel nib (made by JoWo, which is a good sign) and the ‘fire’ acrylic. This acrylic reminds me of video games, for some reason lurking in my subconscious, and it is gorgeous. There are many other options if it doesn’t appeal to you. It’s a beautifully finished pen. Manoj clearly knows what he’s doing. It’s a good size, too, being comfortable to use either posted or unposted. The clipless cap pushes on to post and does so deeply and securely. It screws closed and this is a weakness: it takes an awful lot of turns to close or take off and it’s a little annoying. It would be nice if you could do this more quickly. The nib, as you would expect from JoWo, is smooth and wet and reliable. It’s lovely to write with. You can use any standard international cartridge, the supplied converter or even, with a bit of silicon gel applied to the threads, use the Bangalore as an eye-dropper, in which case it will hold approximately several bucketfuls of ink. I’m very lucky to be sent pens to try out but sometimes the financial consequences can be dire. In this particular case it is going to cost me money because I’m going to need to buy a Fosfor pen to keep for myself. Fortunately they are incredible value. 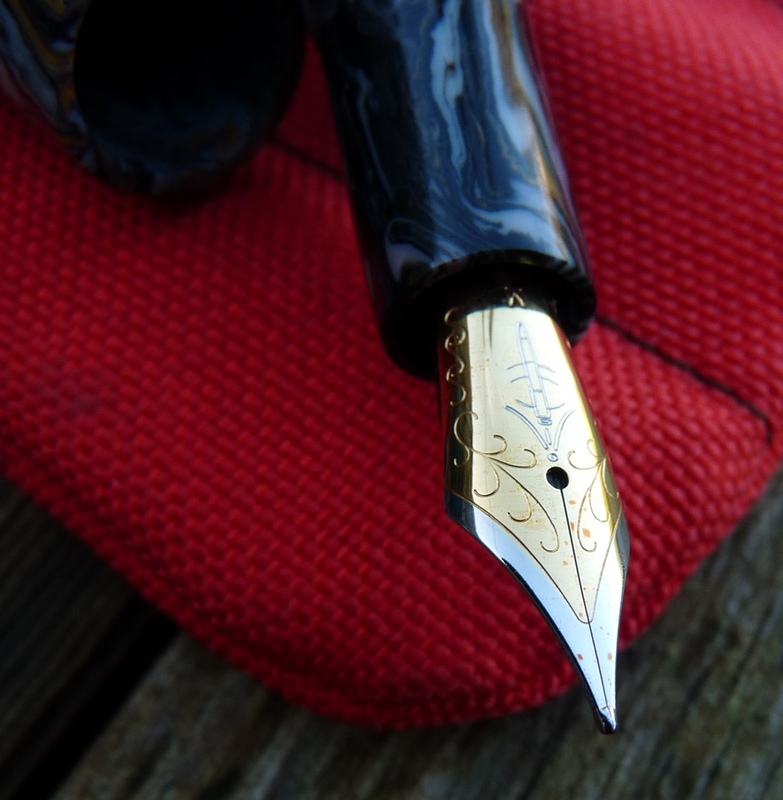 The Bangalore is a great writer, comfortable in the hand, has a unique look and is handmade. The number of turns needed to close the cap can be very easily reduced by planing up the reqd number of turns. That is an easy modification only the pen would need to be shipped back for a while. Excellent review and very attractive looking material.